It's been a wild holiday weekend in Chicago, especially in River North and the Magnificent Mile. CWBChicago estimates a minimum of 19 arrests between noon on Saturday and 4 p.m. on Sunday related to mob activity, battery, and weapons possession. A number of Mag Mile fight videos from the weekend were sent to CWBChicago. We've included them in this report. The mayhem comes less than a month after similar mob actions were reported on the famed retail strip. 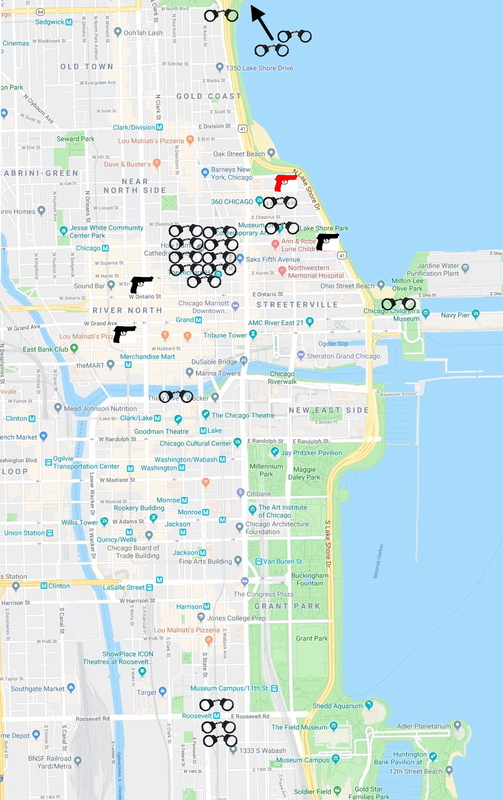 Our team has identified four confirmed cases of shots fired in the Near North area this weekend—in the 500 block of North Wells; at LaSalle and Erie, and in the 800 block of North Lake Shore Drive. Police are still working to determine exactly where the fourth incident occurred. In a low-water mark, an on-duty undercover cop lost his phone to a pickpocket on Michigan Avenue Sunday. Police grappled with large groups of teenagers in the Water Tower area on Saturday and Sunday nights. Their efforts were snarled when the CTA apparently fumbled plans to send trainloads of kids out of downtown on express runs. For years, our team has compiled "highlight" reports of emergency radio traffic heard during Chicago's Pride Parade and St. Patrick's Day celebrations. Now, for the first time, we present a Memorial Day Weekend edition. To be honest, we couldn't figure out any other way to convey the craziness that emergency workers tried their best to contain. 8:42PM — Fights behind the historic Water Tower. Crowd: 200 people, per dispatcher. 8:55PM — Rush & Chicago Avenue: A group ran into Nordstrom Rack, saying someone has a gun outside. Issue appears to be fireworks set off near the historic Water Tower. Also: More cars needed outside the location for a fight. 9:11PM — Sergeant: “We have a Cubs game letting out. Send teams down to the platform at Chicago and State to make sure order is being kept” as the arriving Cubs fans mix with teens waiting to leave via the same station. 9:21PM — Big fight outside the Park Hyatt, says an officer. 9:39PM — “We need everybody we have to try to get rid of these people” at Chicago and State. “Push ‘em to the Red Line.” “Maintain the perimeter, do not let anyone out.” At least four arrests for resisting police. 10:05PM — “Hundreds” running wild in the streets near Roosevelt Red Line station. The train from Chicago and State—which was supposed to run express to 47th Street—stopped at Roosevelt by mistake, an officer says. 10:12PM — Back at Lane Tech, a 17-year-old boy has been punched in the face and robbed by three offenders. Story here. 10:11PM — “I got a group of about 150 running into the Target” store on Roosevelt. "Start blocking these little assholes off!" Three arrests at Roosevelt and State. 10:31PM — 1st District Police station front desk: “Uh, yeah. I guess that group is heading down toward our station, so let the units know we’re locking the front door." 10:39PM — Back downtown, CTA is now holding a train at Roosevelt so all of the kids they let off by mistake can get on and, you know, run express to 47th Street like they were supposed to. 10:46PM — Update on the heavy-set drunk girl at Montrose Beach: "She's laid out in the sand, face down… Fire's not responding and neither is she." 11:31PM — River North: Shots fired. Taxicab struck by gunfire at 500 North Wells. No one hurt. Black BMW with two occupants sped away westbound. No arrests. 2:14AM — Citizen reports a man flashing a gun near Oak Street Beach. Police search the area and arrest 18-year-old Mario Hernandez in the 200 block of East Delaware. 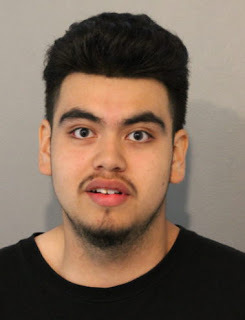 Police say Hernandez matched the description given by the 911 caller and they found a loaded handgun in his waistband during a pat-down search. The handgun was later determined to be stolen, a police spokesman said today. Hernandez is charged with felony aggravated unlawful use of a weapon, misdemeanor possession of a firearm, and misdemeanor theft, police said. He was due in bond court Sunday afternoon. 2:37AM — Officers report shots fired near Ontario and LaSalle. They eventually find witnesses who saw two men fighting at Erie and LaSalle. One got into a red car and fired shots at a black vehicle that fled the scene. Police also found multiple bullet holes in a car parked in the 100 block of West Erie. No arrests, no injuries. 2:46AM — At Clark and Division, Santino says he was robbed by a woman who took his money. 3:26AM — Santino was not robbed. He just didn’t get the drugs he paid the lady for. 2:11PM — A man sitting in a car at Montrose Beach calls 911 to report that a man sitting in another car looks suspicious because he's sitting in a car. 4:28PM — Forty teens were just denied entry to Water Tower Place. They’re heading to Oak Street Beach. 5:26PM — Cop: ”We got about 50 [teens] heading eastbound on Chicago Avenue" toward Water Tower, an officer says. Sergeant: ”We'll go say hello with our arms wide open"
Dispatcher: ”Red rover red rover." 5:30PM — “They're at Water Tower. Open arms, guys." "You got K9 that can come out here?" 6:19PM — "Has anybody seen the Cushman that got stolen from Maggie Daley Park?" 6:24PM — "I have a 13-year-old kid driving this stolen Cushman. Can I get a unit to help me? I'm on a fixed post” and can’t leave this location. 6:55PM — Person shot 1365 North Hudson in Old Town. A fifteen-year-old boy tells police he was shot in the arm near one of the pedestrian underpasses between North Avenue and the Lakefront. The victim and a witness say they were walking when an unknown man pulled a gun out of a fanny pack and shot him. Victim treated at Lurie’s Children Hospital. Police say they’ve been near the underpasses for hours and didn’t hear any gunfire. Suspect description: Black male about 16-years-old wearing a white “Champion” shirt with a white shirt wrapped around his head. 7:40PM — Five arrests at Chicago and State. Whew! Busy night so far. At least CTA won't stop the express train and let a bunch of kids off too soon. 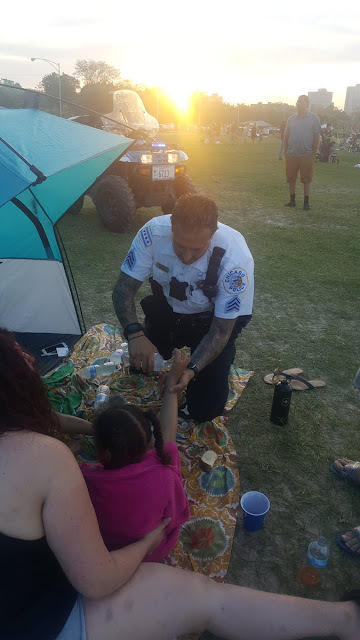 8:09PM — Two arrests at North Avenue Beach. Tactical units are brought in from four outside districts to secure the area around Water Tower and Chicago/State. 9:37PM — 18th District commander: “We’re not done yet, but can you please thank everyone for me… they did a great job getting this under control pretty quickly. Thank ‘em." Dispatcher: “Thank you to everyone. All of the 18th District cars, [Violence Reduction Initiative Units, radio response teams, [17th, 22nd, 14th, and 1st Districts], bikes, overtimers, and me." 10:20PM — Arrest at Navy Pier. 10:30PM — Arrest at Riverwalk. 10:56PM — The manager of Grand Lux Cafe is chasing 11 women who just dined and dashed on the Mag Mile. 12:30AM — Sergeant at Oak Street Beach: “OK. We’re gonna clear out the park”…again. 1:08AM — Woman reports being beaten by a group of ten men in their 20’s at Fairbanks and Ohio. 2:18AM — Police report hearing loud gunfire at Chicago and Lake Shore Drive. A suspect is seen running into Streeterville when police try to stop him. Two shell casings are recovered by police. A large crowd had built up in the area when shots rang out, police said. 2:27AM — All extra units downtown are ordered to the lakefront to break up the crowds again. 4:39AM — Apparently unaware of what police are doing above ground, CTA workers at the Jackson Red Line station say a man just broke their dustpan and broom. 8:02AM — In Lakeview: “Caller says he took drugs yesterday and now he's going out of his mind.” Man is later said to be jumping on the ambulance that came for him. 2:44PM — Two undercover cops stationed near Water Tower Place report that a pickpocket stole their cellphones. Loyola University Police later find the phones at Pearson and Wabash. No arrest reported. 3:09PM — For once, using the phrase “IT’S LIT” may be appropriate: At Adler Planetarium, a group of 20 people is fighting with “bats, knives and hot coals.” Police find a man who had his head split open by a bat. Five suspects are also stopped. The bloody man and all witnesses refuse to co-operate with officers. Ambulance crew treats the victim. 3:32PM — Proving just how intelligent they are, CPD's Intelligence Unit has an offender in custody at the lakefront chess pavilion, North Avenue and the lake. 3:58PM — Fight breaks out by the main lifeguard tower at North Avenue Beach. 4:10PM — Big fight on the lakefront between Oak Street and North Avenue. Dispersed. ….and it’s still going…CWB's team will file updates with any significant developments on Tuesday and Wednesday.